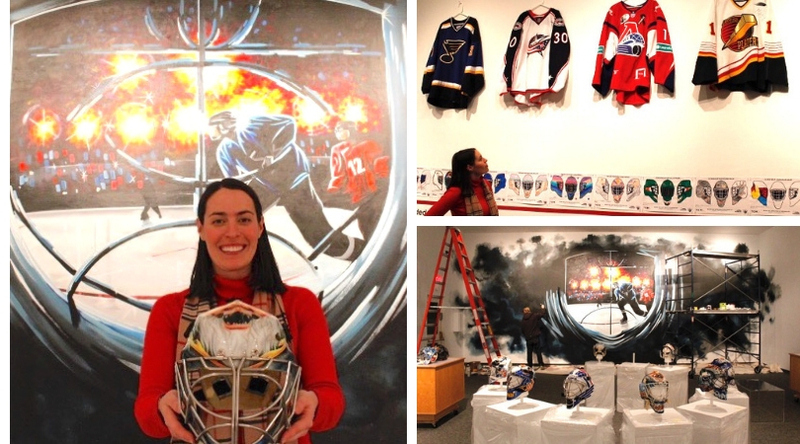 The new exhibit at The TOM combines art and hockey….finally! | Rrampt. 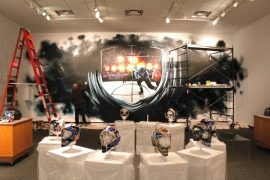 Home Art The new exhibit at The TOM combines art and hockey….finally! 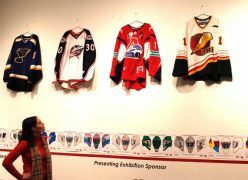 The new exhibit at The TOM combines art and hockey….finally! 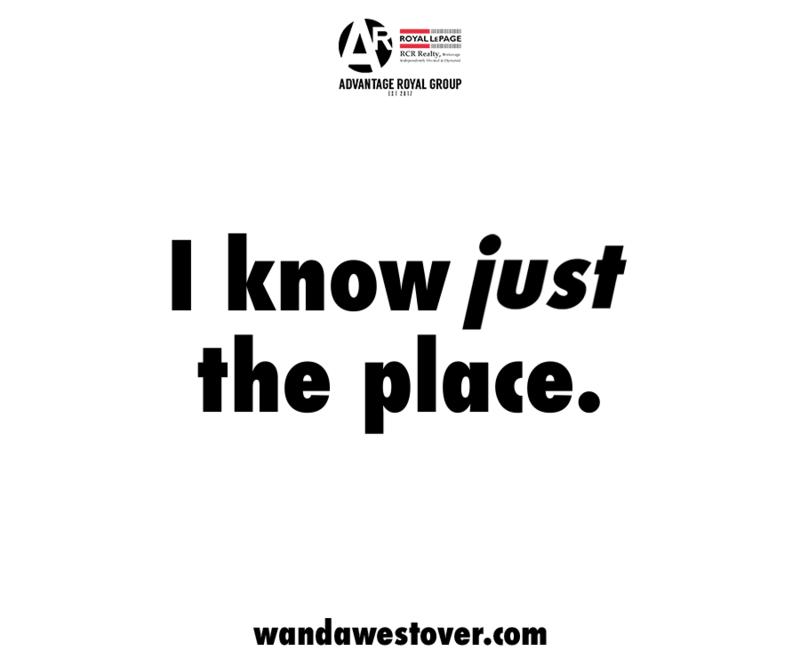 When you think of Owen Sound, many things likely come to mind: Inglis Falls…Summerfolk…Harrison Park…Labatt Crystal. But I bet that hockey and art both make the list, as well. 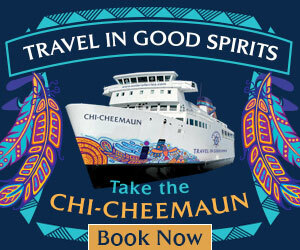 I mean, what other city of 22 000 has both an OHL team and a national cultural attraction in the Tom Thomson Art Gallery. It’s a pretty unique city, and the upcoming Saving Face: Art in Front of the Hockey Net exhibit is equally unique. It’s about time art and hockey were married, and The TOM is providing the altar. I guess that makes Heather McLeese the officiant. She’s curating the exhibit, so she’s the one we wanted to talk to about how this all came about. 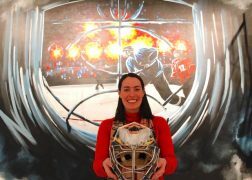 She says the idea began when David Huff, Acting Director of The TOM, met Curtis Sanford, Owen Sound native and longtime NHL goalie, at an event, and they got to talking about the art that’s displayed on goalies’ masks. “It kept building [from there],” she says. “It’s really hitting home with our local audience…we’re in a hockey community so when people hear we’re profiling these as works of art, it changes how [they] are looking at them,” which may affect the way Owen Sounder’s spend their Saturday nights, hands clenched, watching Mack Guzda and Andrew MacLean stop pucks at the Harry Lumley Centre. Maybe the crowd will take a second to appreciate the intricate air-brush art splashed across the keeper’s lid, often designed to intimidate the other team. Sanford offered Huff ten masks from his time playing for the Blues, Canucks, and Blue Jackets, and many include a menacing image of a wizard – the Sandman – as was his moniker. I guess that conversation between Sanford and Huff was the engagement for this ‘marriage’ of hockey and art, and the ceremony is taking place on Friday from 6 – 9pm at the Owen Sound gallery. The whole area is invited. And kids are more than welcome. In fact, they’ve done a lot of work to make this a success. The TOM has reached out to schools to have their students design their own masks, which will don the walls of the TOM representing a crowd at a hockey game. The Owen Sound Platers sure brings back some memories. I ask if the hired artist, Billy Goodkat, would be allowed to create his own mask, as well, and McLeese laughs and tells me he needs to finish the mural he’s working on first, one that’s intended to offer a glimpse of what a goalie sees. “He took it another level,” McLeese says as she points to the wall behind us. “He’s captured it in an incredible way and I think people will be really excited to see it,” she says. “I think that he’s painting the town – all the storefronts downtown, and the alley way.” And not to mention to beautiful mural behind The Roxy, which is where McLeese first met Goodkat and knew that he would be the one to paint the gallery when the time came. In addition to the mural, there will be ten of Sanford “The Sandman’s” masks, one from local NHL’er Steve Silverthorn, and one from the successful keeper Geoff Couture. The whole back gallery has been edged in the fashion of a hockey arena with jerseys, boards, and even sponsors like McArthur Tire traced out. There will also be a progression series to show the artistic process of designing a mask. “A lot of times it’s very personal stuff on there” McLeese has learned. For example, Sanford’s masks don’t only include images of the wizard, they are also adorned in tributes to his wife and three boys. And he wouldn’t dare put a mask on that didn’t have the symbol for good fortune painted on it somewhere. 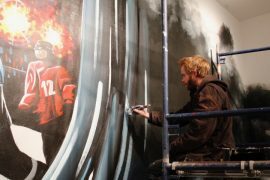 “Air brush art is very difficult… and painting on a sports object isn’t necessarily regarded as fine art,” McLeese says, but exhibits like this are breaking down the barriers between sports and art. The Hockey Hall of Fame does highlight some of the aesthetics of sports, but this is a much more obvious attempt and it’s been in the works for awhile now. In lead up to it, The TOM ran a workshop during the Northern Lights Festival for kids and families to design their own masks and display them on the gallery walls. “Part of what we do here at the Gallery is that we’re all about engaging young students and artists,” McLeese says. When the exhibit opens this Friday from 6 – 9pm, both Gouzda and MacLean will be in attendance to chat with patrons, and coming in January is a 6 ft high goalie mask that will be an attempt to break Instagram. Everyone’s welcome to come take a pic of themselves with it in the Gallery. 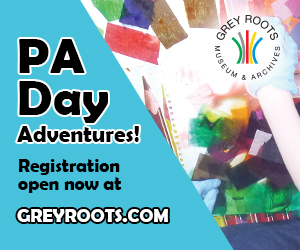 This whole exhibit is sure to gain some attention province-wide and is sure to be a tourist attraction for people looking for a unique experience. And now when people think of Owen Sound, they may think ‘that’s the place that finally brought art and hockey together’. Now only if The TOM could serve some ice-cold Labatt Crystal to enjoy while admiring the art, I know that’d make a few friends of mine pretty happy.